Where Will Jake Peavy Go? The economy’s influence is being felt everywhere, and baseball is no exception. For large market teams like the Yankees, Mets, Red Sox and Cubs, the impact isn’t quite as big: after all, many of these teams have their own television networks for starters, not to mention a larger pool of fans to draw revenue from. Here in San Diego, things are a bit different. Attendance marks are reaching historic lows for Petco Park this season, which speaks to the quality of the team as much as the economy. 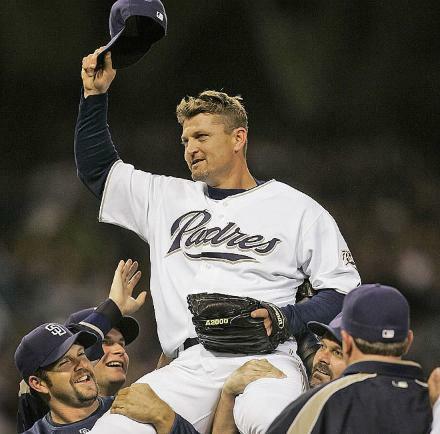 No single move signaled this change more than San Diego icon Trevor Hoffman’s departure to Milwaukee in the winter. I can tell you firsthand that no matter how badly the Padres were playing, people still came to games hoping to hear Hell’s Bells and see Trevor come in to notch yet another save on his Hall of Fame resume. San Diego didn’t put forth a huge effort to sign him, and while it was sad to see him go, Trevor’s hissy fit during his last free agent contract in 2005 prepared both the fans and Padres management for this scenario (Trevor, insulted by the offer at the time, reportedly went to the clubhouse and made a scene by cleaning out his locker). Similarly, Khalil Greene’s salary was dumped on the Cardinals. Brian Giles however, was retained: faced with the option of buying him out for $3 million or picking him up for 2009 at $9 million, the team decided it was worth the $6 million difference to have a veteran presence on the team (and we’d assume they’ll look to trade him at the deadline). Giles has no-trade provisions in his contract, however, so he may opt to stay in his hometown and finish the season in a relaxed environment (as opposed to the pressure of a pennant chase and playoff run in a major market). Even though the economy will be blamed, I’ll give the Padres credit on this: they just weren’t going to contend this year, so why spend the money on aging veterans? Better to restock and reload than try to win with a squad that had its moments, but just isn’t going to get it done in 2009. Or 2010, for that matter. Sure, it may irritate casual fans to see the team not spending money on improving this year, but in the long run, this is the way to go. Which brings us to Jake Peavy. Cy Young award winner, and an elite pitcher over the last five years. He’s also 28 years old and owed $52 million from 2010-2012. 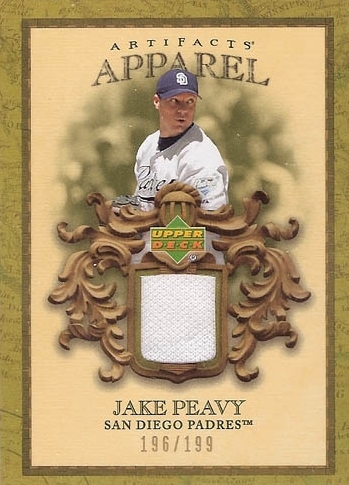 When you consider that it’ll probably be a few years until the Padres are contenders again, it makes sense to trade Peavy, which achieves two goals for the team: get back top young prospects who can help make a future Padres team better, while freeing up salary to do the same. And although Peavy is a top pitcher, clearly one of the best, his effectiveness lies in his fastball. As he gets up there in age, the velocity will naturally decline. So the time to trade him is now. Assuming his slow start gets evened out (and there’s no reason to think otherwise), Peavy is likely to be the catch of the trade deadline. As teams gear up for the playoffs, being able to put another ace in your pocket can make the difference between going home early (sorry Cubs fans), or raising a championship banner. Here’s a look at the teams most likely to be in on this summer’s Peavy sweepstakes. Keep in mind that to even consider this move, a team needs to be in a position to make the playoffs (with one exception, see below), needs to have quality prospects to offer back to the Padres, and has to be able to take on payroll. It’s also critical to note that most trade deadline deals like this one are typically a “rental”, as a player goes from a losing team to a contender, right before heading to free agency. 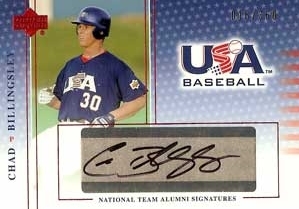 Carlos Beltran with the Astros in 2004 and CC Sabathia with the Brewers last year are two good recent examples of this. The team that gets Peavy will be able to hold onto him for much longer, making the investment, particularly when it comes to prospects, easier to handle. One more factor to consider? Peavy has a no-trade clause, so he’ll need to personally approve a deal before it happens. Chicago Cubs: Peavy nearly went to the Cubs this winter; in fact, for a few days it practically seemed like a done deal. But both teams were in the process of being sold, making such a contract hard to move at the time. The Cubs are an aging team with a closing window of opportunity (one that has really already started to close; see Derrek Lee’s decline and Aramis Ramirez’s injury for starters), so the Peavy deal still makes sense. If Rich Harden can stay healthy and effective, and if Big Carlos Zambrano can avoid decline (pitching 200+ IP in five straight years before you turn 27 can do that to you), Peavy would be a nice addition. A lot of “ifs” in there, and while it would be in the Cubs best interest to act, you can’t help but wonder if they’re still the best match now that the season is underway. Los Angeles Dodgers: Thanks to a certain, recent 50 game suspension, the Dodgers now have an extra $7 million or so at their disposal. Having room for Peavy would be the ultimate way to make lemonade out of lemons. Behind rising star and young ace Chad Billingsley, the Dodgers have the reliable, if unspectacular Randy Wolf. Beyond that, Clayton Kershaw, who at age 21 probably needs some more experience to harness his talent. And then minor league guys like James McDonald and Eric Stults (who may end up being solid contributors), coupled with injured veterans like Hiroki Kuroda and Jason Schmidt. A move for Peavy would stabilize the rotation, and gear up the team for a run at the playoffs, when they’ll also have their controversial slugger back in the fold. New York Yankees: If we’re talking about a team looking to dump salary, you have to imagine the Yankees will at least take a look. Granted, they fortified the rotation with Sabathia and Burnett this off-season, but Wang looks lost, Pettitte is looking older, and many fans are eager to see Joba stabilize the bullpen. Trading for Peavy would all but guarantee the latter, not to mention giving the Yankees one of the more impressive rotations in the league for years to come. The only issue would be whether or not Brian Cashman is willing to trade his prospects, something he wasn’t willing to do a few years ago when Johan Santana was available. And would Peavy want to move to the American League, not to mention New York? 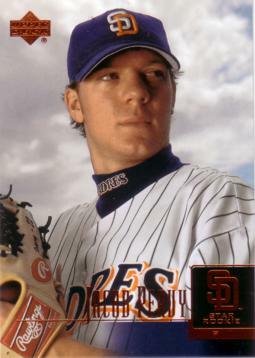 Considering how the new stadium has played so far, Peavy might not want to deal with the anti-Petco on the east coast. New York Mets: The Mets have the prospects to pull off such a deal, not to mention the need in their rotation. With Oliver Perez (and his $36 million contract) in pitching purgatory, the Mets have John Maine, Mike Pelfrey and Livan Hernandez behind the spectacular Johan Santana. Not the most stable or reliable group of starters. It’s a great fit for Peavy, but by most accounts, the Mets have reached their payroll limit. Otherwise, they would have made a bigger play for Manny Ramirez or Orlando Hudson this winter. Things may have changed by this summer, with the Mets’ need for pitching stronger, and Delgado/Wagner’s contracts coming off the books in 2010. Omar Minaya has a track record of pulling off deals when the Mets weren’t even considered (see the trade for Putz as setup man soon after they traded for K-Rod to close), so don’t be surprised if he does it again. Also, in contrast to the Yanks’ new stadium, CitiField is playing like an east coast version of Petco so far. 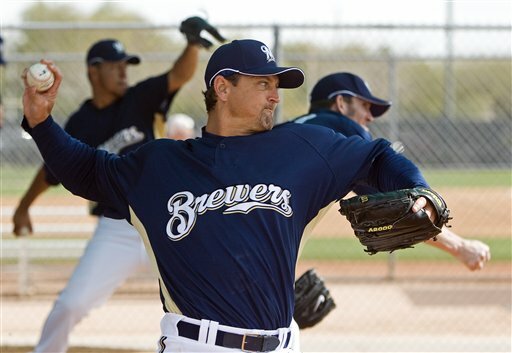 Milwaukee Brewers: They did it last year with Sabathia, and might do it again this year with Peavy. 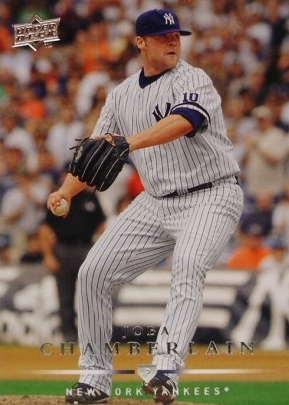 Wouldn’t that be something, a Peavy/Hoffman reunion at Miller Park? The Brewers are typically not the kind of team to spend lots of money, but by most accounts they offered Sabathia a 5 year, $100 million contract to retain his services this past winter. Not enough to outbid the Yankees or the larger market teams in California, but it does show that they have the need for an ace, and are willing to spend money to get one. If Yovanni Gallardo stays healthy, and the Brewers continue to play well, you have to consider them in the mix here. The Brewers also have a cast of strong position players to offer, both in the minors and on the major league squad, who have solid potential but are often miscast defensively. The Padres would be happy to obtain some of them, and put them into roles where they can prosper. Washington Nationals: Am I crazy? Perhaps. But the Nationals’ biggest issue right now is pitching. Slot Strasburg behind Peavy, put John Lannan into the #3 slot, and suddenly you have a serious rotation. The Nationals have also shown they have money and are willing to spend it: they were in on Mark Teixeira until the Yankees finally outbid them, and threw $20 million at Adam Dunn soon after, certainly for reasons other than contending this year. Such a move would not be for this season, but between this move and some smart decisions in the winter, they could suddenly become contenders in the competitive NL East for 2010. Los Angeles Angels: After losing out on retaining Teixeira’s services (sensing a trend here? ), the Angels surprised most by going after Sabathia next. Given that their pitching is strong, and the offense is what needs some help, this was looked at as an odd move. If the Angels still have this philosophy, and would prefer another ace over a bat, you have to think they’ll be sending some scouts down I-5 to take a look at Peavy. Presumably, Peavy wouldn’t mind staying in Southern California either. 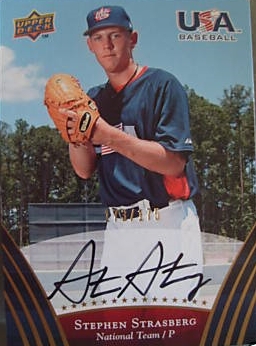 Atlanta Braves: Being an Alabama native, Peavy made it known that he’d approve a trade to the Braves the first time this trade carousel went around. But given their lack of offense and mediocre start, unless they can made up ground against the Phillies, Mets and Marlins, it’s doubful Peavy will want to go from one losing team to another. Houston Astros: Another preferred team close to Peavy’s hometown, but they’re in even worse shape than the Braves these days. Not likely to happen, especially if the Astros wisely wake up, and start rebuilding for the future themselves. Texas Rangers: Yes, they’re contending now, desperately need pitching, and they’re a team in the South. But no pitcher in his right mind would choose to pitch half his games in Arlington, a place where home runs are plentiful, and pitching careers go to die. Kansas City Royals: Ownership has made a commitment to raise payroll, and long suffering Royals fans would be energized by a Greinke/Peavy 1-2 punch that would be the envy of the league. However, if the Royals are still contending at the deadline, their priority should be offense, and more offense. The rotation is not their issue. Boston Red Sox: Ever dangerous in the trade market, the Sox always seem to have prospects and payroll available to take advantage of a situation when it presents itself. However, in this case, conventional wisdom says their pitching depth is too great for them to contemplate adding Peavy to the fold. Aside from proven pitchers like Lester, Beckett, Matsuzaka and Wakefield, they have kids with potential in Masterson and Buchholz. Throw into the mix low risk, high reward veterans in Brad Penny and John Smoltz, and it becomes clear that the Sox practically have enough pitching depth for two teams this year. However, Theo Epstein is very savvy, and pounces on an opportunity when he sees it. Case and point, his pursuit of Mark Teixeira this past winter. The Sox certainly didn’t have an outstanding need for the switch-hitting slugger, with Youkilis at first. But, they saw the situation as an opportunity to improve long-term, planning to shift Youk to third, leaving Mike Lowell the odd man out, presumably to be traded. So, even though the Sox have less of a need for Peavy than practically any other team in the league this year, they may jump at the opportunity to do so anyway (especially if Lester and Beckett continue to underperform). Being only a week or so into May, a lot can change between now and the trade deadline. Teams that look like buyers now might become sellers, aces can get injured, and so on. But something we can more or less guarantee is that Peavy will be heading out of San Diego, and will change the complexion of a division race and the playoffs. Given that his contract keeps him under control for a while, the prospect package San Diego gets in return should be hefty, helping them gear up for the next solid Padres squad. And with Peavy’s no-trade clause thrown into the mix, plenty of drama should result before a deal is made.